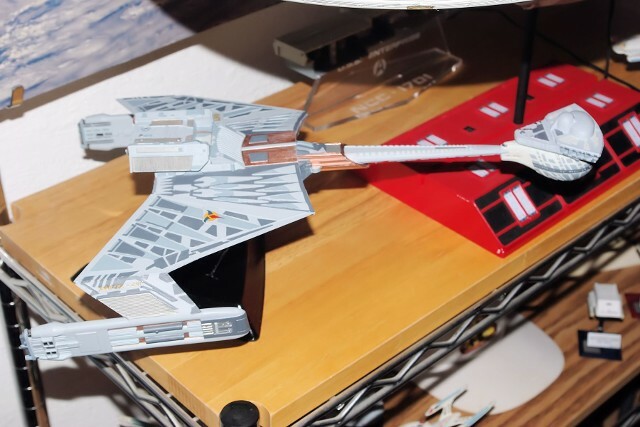 The AMT D-7 Klingon Battle Cruiser was a replacement for a model i built years before and donated to a local museum prior to our move to the Chicago area. 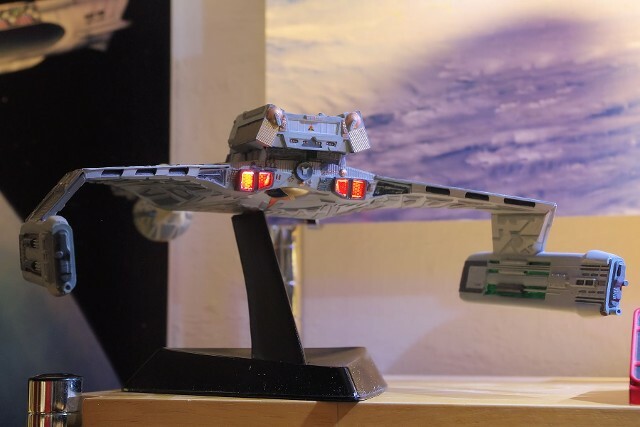 I decided to do a basic interior lighting scheme prior to purchasing the model on eBay. 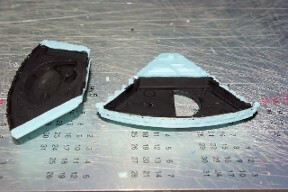 The interior of the forward hull was "light-blocked" with flat black paint. All of the windows were drilled out prior to this. The same treatment was applied to the interior of the Bridge Support decks. The Engineering Hull upper section was going to be used to house the on-off switch and allow access for battery replacement. 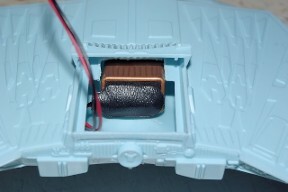 The battery was intended to be located within the wing box, underneath the Engineering Hull. The Impulse Engine regions were opened up in order to allow the creation of the housings needed to do lighting of the engines. 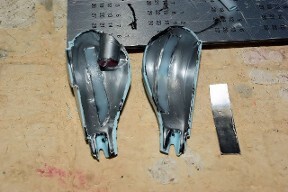 The rear detail of the wing box was not molded well, so I used pieces of thin sheet styrene shaped to reinforce the detail quality. These would later be sanded and painted to blend in. 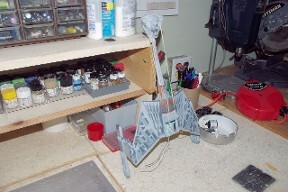 The wing box was painted in Neutral Grey as a base coat. 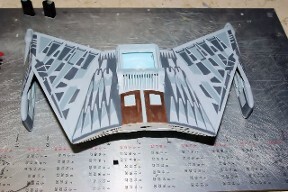 The upper surface of the wing box was detailed by painting the embossed "Bird of Prey" patterns with two additional levels of Grey - Gunship Grey and German Grey. The radiator panels in front of the Engineering Hull were painted copper, as research had indicated was correct. The same receipt was used on to the underside markings. 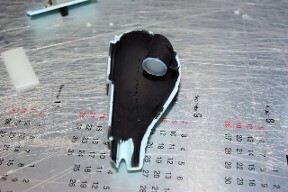 The two impulse engine light boxes were fabricated from sheet styrene. All sides and the interior end panel were light-blocked in flat black. A single red LED with its own current-limiting resistor was installed in each and lead wires installed and insulated prior to install. Strips of translucent plastic were placed over the window areas and cemented into place. 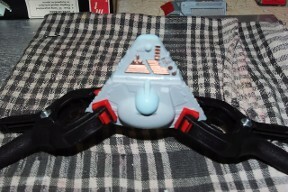 The Photon Torpedo tube interior end was opened up and a disk of translucent plastic, which was painted in clear red enamel. 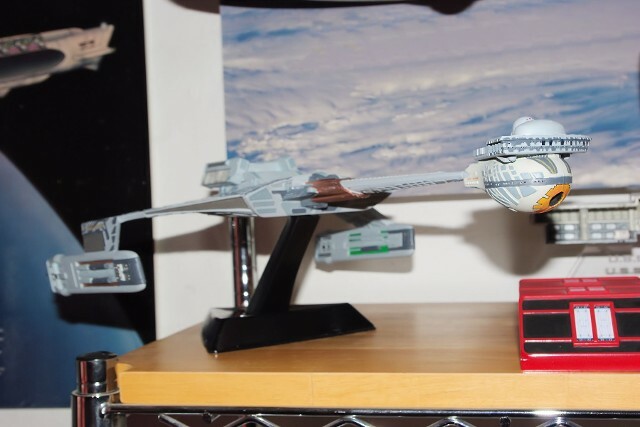 The entire interior surface of both halves were over-coated with Chrome Silver, as to reflect the interior LED light throughout the volume of the hull. 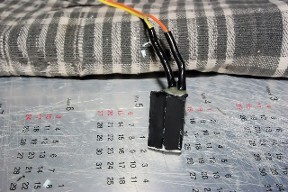 Seams were covered with aluminum tape. 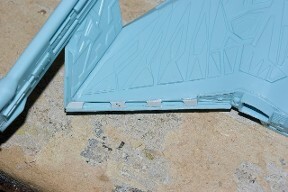 The Forward Hull Support Neck was channeled out to allow passage of wiring inside, then assembled and detail painted. 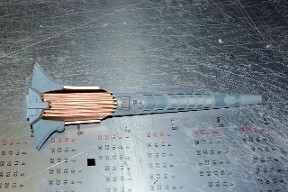 The Neutral Grey base coat was applied, then the radiators were done in copper, and the chevron markings in three degrees of Grey - German, Gunship and Camouflage Grey. 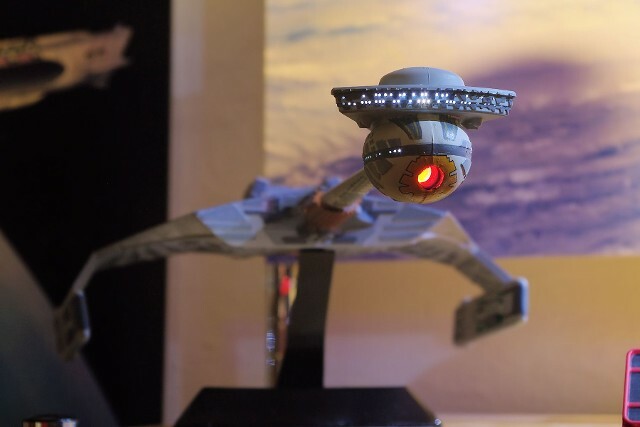 The primary LED cluster for the Forward Hull is a pair of bright white LEDs, working off of a single current-limiting resistor. 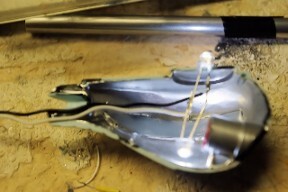 The leads of the LEDs are placed to create a bar-bell shaped arrangement which will provide light for both the the upper and lower sections. The LED assembly is placed into one half of the lower Forward Hull. 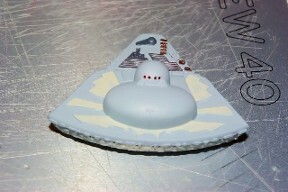 Small holes in the upper surface hold the top LED in the center of the attachment locator of the upper hull deck section. the reflective quality of the hull interior can be seen. The lead wires will exit though the Support Neck after assembly. Once the assembly of the hull halves and the support neck is completed, the seam was checked for light leaks. The seam was reinforced, sanded and painted flat black. 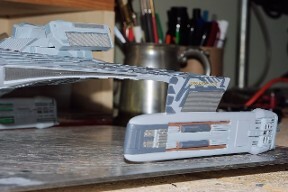 Meanwhile, the halves of the Forward Hull upper section were assembled and its surface elements detail painted. Prior to assembly, the interior surfaces were coated in Chrome Silver to allow for reflection, and translucent plastic was installed in front of the drilled window openings. Four small windows were added to the bridge dome and filled with clear red from the inside. 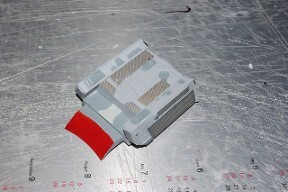 The white end panels of the Impulse Engine light boxes were painted Clear Red. Once dried, the boxes were inserted into position. the lead wires were drawn out for final system wiring. 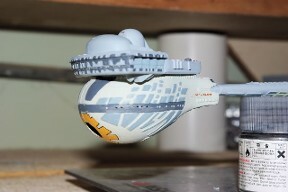 The upper section of the Engineering Hull was also done in Neutral Grey base, then detail painted. The Italian Red front panel will be vi sable through the grille work of the lower engineering Hull section of the wing box. 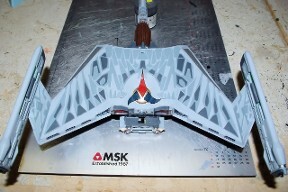 The Forward Hull / Support Neck assembly is brought together with the wing box. 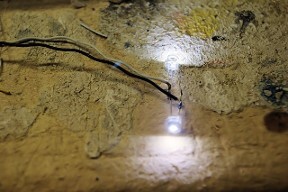 Once the wiring is drawn through and alignments checked, the two are cemented together. 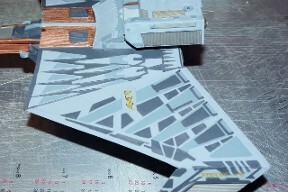 The upper engineering hull is trail mated to the wing box. The fit is good, but loose. 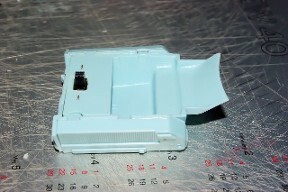 Plastic tabs are added to the rear interface line, which snag the upper edge of the wingbox opening and hold the upper section in place. Detail paining of the warp engines included bright green areas on the inner surfaces, in order to represent the glow of the ward coils. 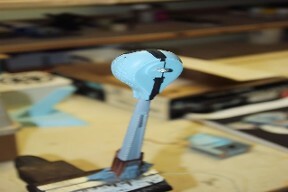 Close-up of the assembled forward hull. 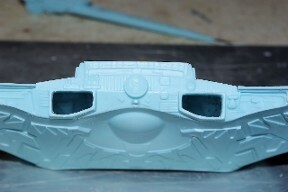 The base coat for the lower section was Camouflage Grey, with German Grey used for the forward window edge relief. 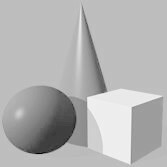 Neutral Grey was used on the embossed markings. 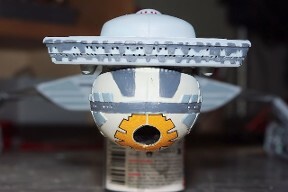 The decal provided for the perimeter of the Photon Torpedo Tube did not meet at the center, so the area was touched up with Insignia Yellow enamel. The interior of the Photon Tube is flat black. 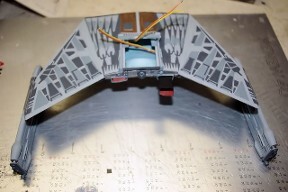 The final decal installation was done, including the Klingon insignia on the lower wing box surface, as seen here.